Many Easter traditions have been around for centuries, but you won’t find these traditions in the Bible. The most common symbol of Easter is the Easter bunny, which was reportedly introduced by the German immigrants to America with stories of an egg-laying hare. It is believed that the decoration of eggs dates back to the 13th century while the rite of the Easter parade goes back even further. Easter Candy which is another tradition are modern additions to the celebrations of Easter. The long-eared, short-tailed Easter bunny who delivers decorated eggs to well-behaved children on Easter Sunday is not mentioned in the Bible, but has become a prominent symbol of Christianity’s most important holiday. The exact origins of this mythical bunny is unclear but rabbits which are known to be prolific procreators are a symbol of new life and fertility. Some sources say that the Easter Bunny first arrived in America in the 1700s with German immigrants who lived in Pennsylvania and transported their tradition of an egg-laying hare called “Osterhase” or “Oschter Haws”. Their children went to make nests in which this creature could lay its coloured eggs. Eventually, the custom spread across the U.S. and the fabled rabbit’s Easter morning deliveries included chocolate and other types of candy and gifts, while decorated baskets replaced nest. Children also left carrots out just in case the bunny got hungry from all his hopping! Even though Easter is a religious holiday some of its customs such as Easter eggs are likely to be linked to pagan traditions. The egg which is a symbol of new life has been associated with pagan festival celebrating spring. In the eyes of Christians, Easter eggs represent Jesus’ emergence from the tomb and resurrection. Decorating eggs dates back to at least the 13th century. Eggs use to be a forbidden food during the duration of the Lenten season, so people would decorate and paint them to mark the end of the period of penance and fasting, then eat them as celebration on Easter. 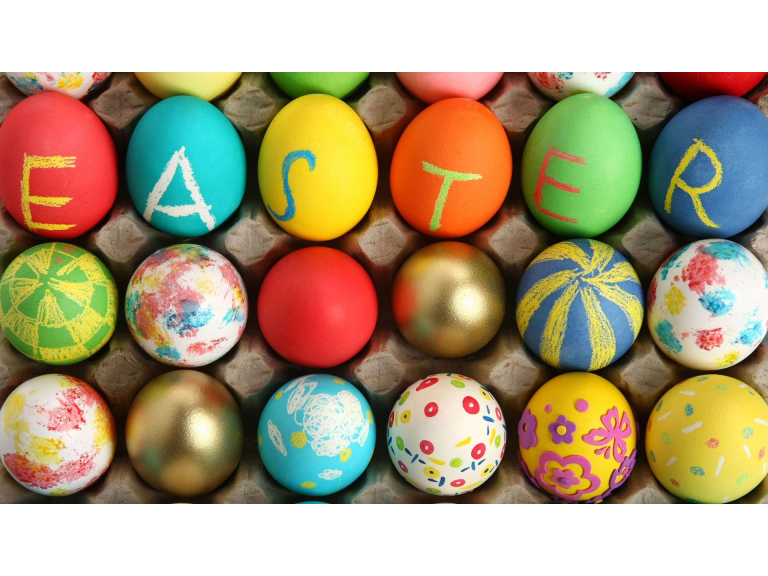 Two popular traditions at Easter is Easter egg hunts and egg rolling. In the U.S the White House Easter Egg Roll is a race were children push decorated, hard-boiled eggs across the White House lawn, this is an annual event held on the Monday after Easter. The first of these events happened in 1878. The president back then was Rutherford B. Hayes. Second behind Halloween, Easter is the best-selling candy holiday in America. Among the most popular sweet treats associated with this day are chocolate eggs, which date back to the early 19th century Europe. The jelly bean another egg-shaped candy became associated with Easter in the 1930s (although the origin of the jelly bean reportedly dated all the way back to a Biblical-era concoction called a Turkish Delight). The National Confectioners Association, say that over 16 billion jelly beans are made in the U.S. each year for Easter, that would be enough to fill a giant egg measuring 89 feet high and 60 feet wide. The Easter Parade in New York City dates backs to the mid-1800s, when the upper crust of society would attend Easter services at various Fifth Avenue Churches then they would take a walk outside afterwards to show off their new spring outfits and hats. Along the side of Fifth Avenue average citizens would come and check what was going on. By the mid-20th century the tradition reached its peak and in 1948, the popular film Easter Parade that starred Fred Astaire and Judy Garland was released. The tradition lives on in Manhattan, with Fifth Avenue from 49th – 57th Street being shut down during the day. Today other cities across America also have their own Parades to celebrate Easter.